For those who have never used O2CM for their event, your at the right place. It's time for you to update your operations and get streamlined with today's technology. A $50 hosting fee: This is paid in advance, at which point you will be emailed a login to your new database. 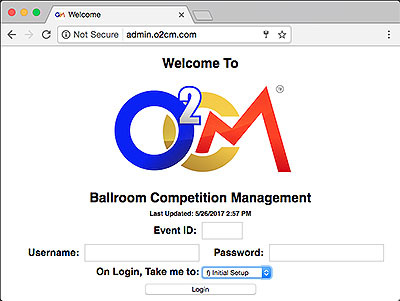 You can then proceed to build your online registration presence and post your event on the O2CM events list. A License fee - calculated at 30 cents per entry: This is due at the time you wish to download your database for use at the event. 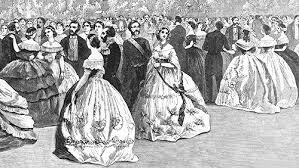 An Entry is two competitors registered for a single event - It does NOT count Rounds or number of dances. If you have already used O2CM for your event in the past, please log in to admin.o2cm.com for your event. Go to the bottom of the Setup page and pay to reset your existing database. A reset simply removes last years entries, schedule and ticket sales. Since the build and ticket structure remain in place, this saves you the time of building the entire event database from scratch. Re-using and resetting your database will also ensure all your historical results are kept in the same place. Please don't set your new event date until after you have completed the reset process. If this is your FIRST O2CM event, OR, you have used O2CM and you are starting a NEW competition, use this new event registration form. Shortly after payment is received, you will get an email with login information and some help on starting the process. Contact support@o2cm.com through email - a team of over a dozen technicians and registrars ready to help you. Decide on a scrutineer/technician HERE and ask them to assist you with your event.